Grout Cleaning Wellington, FL | Tile Cleaning Company | Grout Plus Inc. If you have tiled flooring or other tiled features in your home, keeping these areas clean can be quite challenging. This is especially true when it comes to the grout. Standard cleaners may not get the job done and aggressive cleaning methods could do far more harm than good. 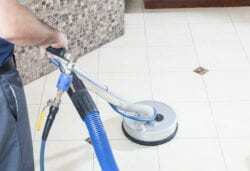 Do you need grout cleaning in Wellington, FL? If so, then Grout Plus Inc. is the company to call. Following are some of the tremendous benefits that you can gain by using these services on a regular basis. To start, this is the best way to make your floor, counters, and back-splashes look brand new. This is especially true in high-traffic areas that are prone to retaining a significant amount of dirt and grime. Rather than having grimy-looking tiles replaced, simply have professionals clean them up for your instead. Once this work is done, the treated area will look much like it did when your tile was first installed. Surprisingly, this is also a great way to get rid of harmful growths like mold and bacteria. Once the grout is no longer properly sealed, it can be easily invaded by organisms that can have a negative impact on the health of building residents. You might be tempted to use a store-bought bleaching agent, but this can actually break fill materials down. Moreover, if you have colored grout, chlorine bleach can leach this out or it may simply cause it to fade. When your services are complete, these areas won’t just look better; they’ll actually be free of harmful germs as well. This is one of the easiest and most affordable ways to improve the overall look of your home. This is particularly true if you happen to have a lot of tiled features. With a single treatment, you can make much of the building interior look like it was just remodeled. Best of all, you can do this at a mere fraction of the cost of tile replacement. If you are looking for an easy way to spruce up your living space ahead of any big event or before selling, Grout Plus can help. This is an excellent strategy for enhancing the overall marketability of your abode. Moreover, it will give your home the fresh, clean and visually appealing look that is often necessary for impressing party guests. One of the major benefits in working with seasoned and qualified professionals is simply being able to get the results you want, without the risk of damaging your interior design features. You will find that many store-bought cleaners are unnecessarily harsh. Moreover, using aggressive scrubbing methods and abrasive products is certain to diminish the integrity of the tile features that you are treating. By hiring a reputable tile cleaning company in Wellington, FL, you can also maintain the integrity of the finishes throughout your home. If your provider discovers that your grout needs to be resealed, this can be easily taken care of at this time. This is an effort that will greatly extend the overall lifetime of your grout and your tiled features. You will invariably get a much deeper clean than if simply using a store-bought, household cleaner. More importantly, you won’t have to worry about any harm coming to your floors, counters or other tiled elements during this process. Call (561) 753-7090 today for a free estimate! Find out how Grout Plus Inc. can help extend the lifetime of your tile and improve the overall look of your home with a quick, simple treatment.